The role that a property inspector takes on when they’re hired by a prospective homebuyer shouldn’t be difficult to define. But as with most professions, not all inspectors stand on equal footing—some may provide only a basic overview of a home’s accessible features, while others go the extra mile to help clients gain a comprehensive understanding of the home’s condition. Since 1993, HomePro Inspections has served Richmond and the surrounding areas as one of the most recognized, respected home inspection firms in Central Virginia. 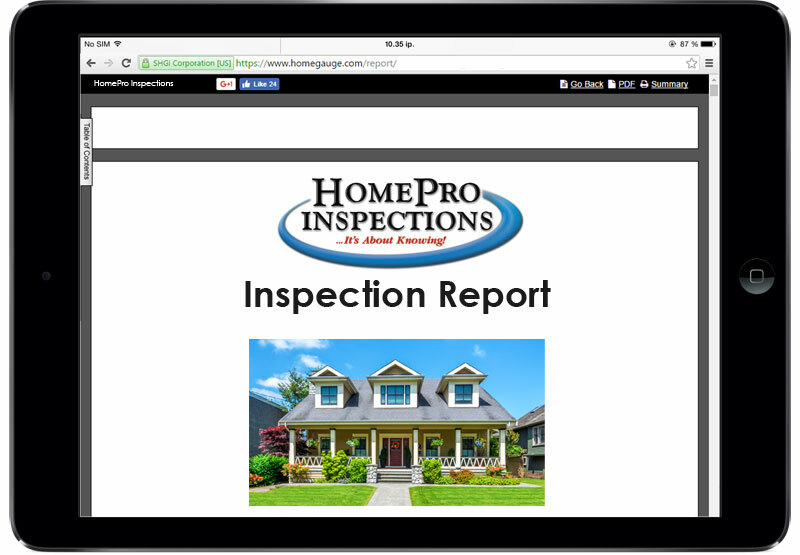 HomePro Inspections provides thorough, unbiased inspections and detailed on line reports which give you the confidence to make better-informed decisions. Having us inspect a property can literally save you thousands of dollars in costly repairs before you buy, or assist you in preparing your property to sell to a prospective buyer. We do everything in our power to make sure that you’re 100% prepared to make the best decision. Once the inspection is over, we’ll immediately type up a detailed report that thoroughly summarizes our findings—including numerous photographs that highlight certain features of the home and any relevant issues. Your report will typically be available on the same day as your inspection, simply requiring you to log in to our website to view the document. To make the negotiating process easier for you, we include access to the innovative Create Request List™ (CRL™) feature by HomeGauge. I have been using HomePro as my go-to home inspection company for more than 12 years. John is diligent, extremely thorough and knowledgeable about the homes that he inspects – whether he is inspecting new construction or a hundred year-old home. He develops a confident rapport with my clients as soon as introductions are made. He makes the clients feel at ease, while being very direct and forthright about his inspection findings.His reports are comprehensive, easy to follow, and are delivered in real time. Investing in a home inspection with John is money well spent. John has been performing inspections for my buyers for over 10 years now. He is easy to schedule and if I have a tight deadline he always tries to work me in. He is professional and thorough and takes the time to explain everything to my buyers. Also, his reports are well written and easy to understand. I highly recommend John and HomePro Inspections for your home inspections!! Home inspection was done on schedule, and a report was provided very quickly (the same day). We felt the inspection was very thorough, and included good detail of things we had not thought of ahead of time. Not sure we will go through with the purchase, if we do we will certainly go through more negotiations first! If we don’t, and we continue looking for a home, we would certainly use John Jennings’ inspection services again. I was most pleased with the inspection that John conducted. He was thorough in his investigation of the property. The report he rendered revealed all of the problems, especially those hidden to the untrained eye. I am confident that his inspection and report are comprehensive and accurate. The photographs of the property’s deficiencies documented the problems. Thank you John.